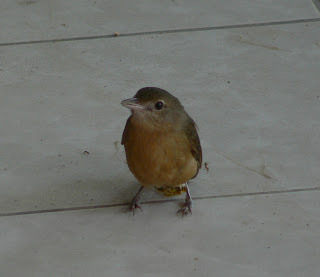 A light 'thump' against the office window and there was this Little Shrike-Thrush sitting on the verandah. It's not unusual for a bird to fly into the reflection on one of the windows ... which leads to the occasional amazing 'up close' photo opportunity! Fortunately most of them do survive and happily this little bird sat recovering for about 20 minutes before flying off. I'm not sure if this is 'our' baby Double-eyed Fig Parrot (see earlier posts) but she has just been feeding on ripe Star Apples in the tree next to the 'nesting tree'. Again rather wobbly but she was pretty high up so hard to keep the camera steady! I have just noticed that our Dove Orchid, Dendrobium crumenatum, has flowered again, although there are now only a few blooms left. This beautiful little orchid is found growing naturally on tropical trees in parts of Asia and flowers when there is a drop in temperature, usually associated with rain - and yes, two nights ago it was quite cool and rainy! The blooms are about 3-4 cm across and only last for a couple of days. The Malay people believe it is a talisman against evil and often plant one near their front door, something we didn't realise when we 'planted' ours alongside this tree-fern ... near our front door! Touch wood, to date it seems to have been working! 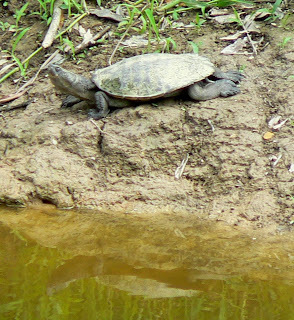 Often spotted on the bank of 'Turtle Pool' at one end of our wetlands-dam, overlooked by Birdwing Bungalow, are several of these Saw-shelled Turtles (Elseya latisternum). They grow up to about 30cm, or 12 inches, and are one of only 16 freshwater species in Australia. They feed on molluscs, fish, crustaceans and start breeding in September, laying up to 20 eggs in the banks of creeks and waterways. All the lychees are now almost ripe enough for picking and this year is the biggest crop we have had for several years. The Rainbow Lorikeets love them by day and the Spectacled Flying Foxes have a go at night ... and they're not even fully ripe yet. Unfortunately they have to stay on the tree to ripen but at least this year there should be plenty for ALL of us ... and I'll be able to make another batch of lychee liqueur! 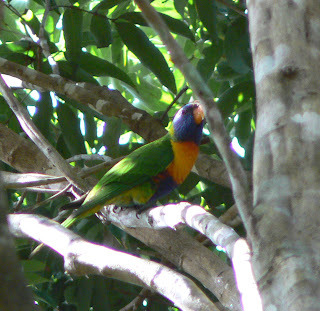 I've just been to check on the enormous trees at the front of our property and dozens of Lorikeets are having a wonderful time squawking and helping themselves - very hard to see in the dense foliage but I spotted this one high up in one of the trees. After a very busy few months we had a quiet few days with no guests booked in so we 'escaped' for a couple of days and stayed at Club Tropical in Port Douglas (highly recommended!) and really enjoyed lots of sleeping, reading and eating-out. A real change-of-pace from our peaceful valley Paradise, and now we're home again with our "batteries recharged" and ready for another busy couple of months. 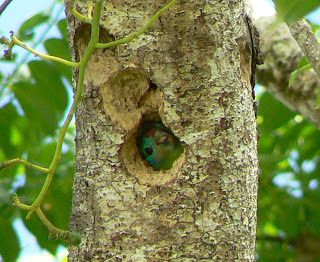 No activity at the Double-Eyed Fig Parrot's nest now so our little bird must have flown! These tiny wasps, which are only about 1cm or just under half an inch long, are quite docile unless they are disturbed ... then watch out! 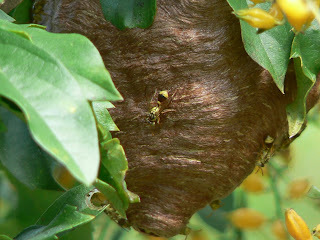 I think they are a variety of Paper Wasp and build their nests in the foliage of various tr ees. If you are unfortunate enough to happen to brush up against one they strike with unbelievable speed and give a very painful sting. It's another magical Daintree day and the Fig-Parrots are furiously feeding their chick (we're now pretty sure there is only one) - I took this photo a few minutes ago and you can now see that it is a female - we guess it won't be long before she takes wing. 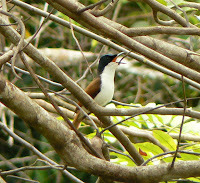 Any day now we are expecting the return of the magnificent Buff-Breasted Paradise Kingfishers as they return from wintering in Asia. Last year we had at least five nesting pairs and as they often return to their old nests (which they build by excavating holes in termite-mounds) we are hoping most of them will be back. Watch this space! It's another beautiful Daintree day today and especially after a little recent rain the country is really looking fresh and green. I spotted this Brown Cuckoo-Dove next to our walking-track yesterday - they are not very shy birds so it was easy to get quite close. 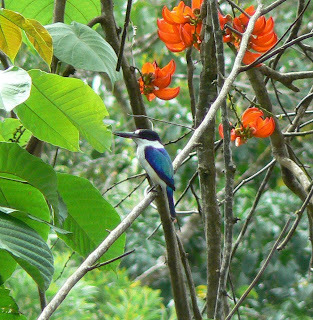 A pair of Collared Kingfishers (sometimes called Forest Kingfishers) have a nest in a hollow in the next tree to the Parrots' but it is almost impossible to take a photo of them feeding as they move so fast. "Mum and Dad" sit on a nearby branch and take turns to swoop up to the nest and back again. We had another interesting visitor yesterday. David Stickley who is one of Australia's leading Crossword compilers called in with his family as they are holidaying here in the Far North of Queensland. I'm an amateur cryptic crossword compiler myself and have had a number of my puzzles published in "Crozworld", the magazine of the Australian Crossword Club, although running Daintree Valley Haven means I don't have as much time for crosswords these days. Almost an inch of rain last night, which is quite unusual for this time of year, but very welcome. Spring has really sprung and the valley is alive with birds - lots of mating-calls, chick-feeding and quite a few "punch-ups", especially amongst the Orange-footed Scrub-Fowl, with several newcomers entering into noisy and quite violent dispute with our resident birds! Yesterday lovely bird-calls in the Hawaiian Peach tree and I spotted this female Shining Fly-catcher in full voice. Female Fig-Parrot feeding her young. Not very clear so will try to get a better shot later!